Environmental activists have apologised to a farmer after planting thousands of organic potatoes in a field which they had mistaken for a crop trial site. 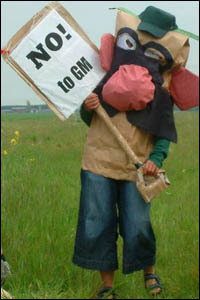 Activists calling themselves mutatoes.org descended on a field in East Yorkshire to scupper a GM trial. But after back-breaking work digging up the rock-hard ground the group now admit they made a mistake. Farmer's son Chris Buckton said there were no GM trials at the site and the field only carried cattle feed crops. In an effort to invalidate the trial of what the campaigners thought was a field full of genetically modified potatoes the group held a rally in Hull before travelling to the farm on the outskirts of the city. But when they got to the area there was confusion over exactly which field they should target. In a statement the group said the map grid reference given by the Department for Rural Affairs (Defra) as the site for the trial was not very accurate. Cath Parker from the mutatoes.org group said they did have an important point to make, but the mistake had been a salutary lesson. "We're a collection of people who have been actively opposing GM crop trials, she said. "We're fairly sure it won't have damaged his crop too much. "It has been incredibly dry for a long time and the ground was very hard. We're very sorry for the trouble we've caused." Chris Buckton, whose family farm at Highfield Farm near Hedon, said: "We expected around five or six people, but when we got there, there was about 200 of them. "They were walking around the field and had what appeared to be a base in the middle. It was a peaceful protest and then someone with a loudspeaker said they were going to plant these potatoes. "They all had a shovel and started to dig. We found it quite funny, you know, it seems really stupid that these guys are supposed to be into the environment, but don't know what a potato crop looks like."